Amazing temples, serene lake and memorial hall surrounded by fountains…these are just some places to visit in Colombo in one day. Colombo was the first stop on my Sri Lanka itinerary. I have landed around 7 am in the morning, in the shape corresponding to the overnight flight including late night stopover in Dubai. I felt sick and tired and all I needed was to spend the whole day in the bed, sleeping and relaxing. But – then was the other part of me, who wants to see everything. The traveler spirit, that knows that when you only have one day in Colombo, you must be out there exploring. In the end, I made a compromise: I took a rest in the hotel and then went off to enjoy of some of the sights that Colombo has to offer. Since some of you might face the same situation, I have decided to share this small itinerary with you. 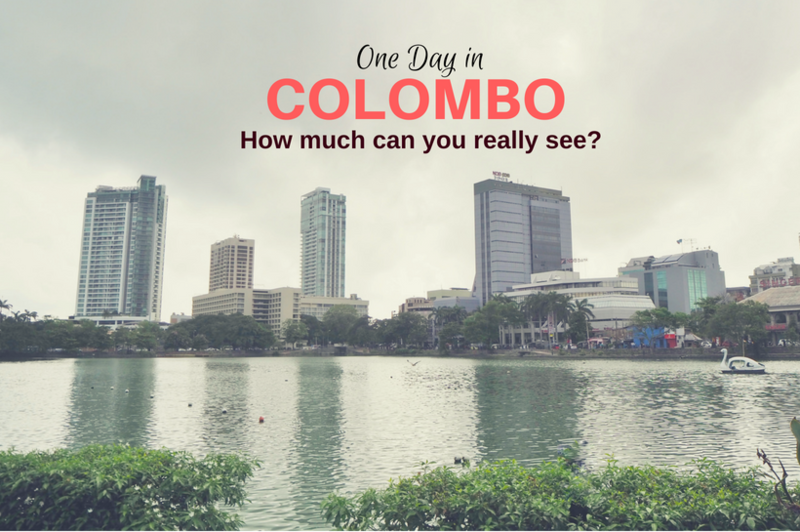 All these places to visit in Colombo are manageable in one day. 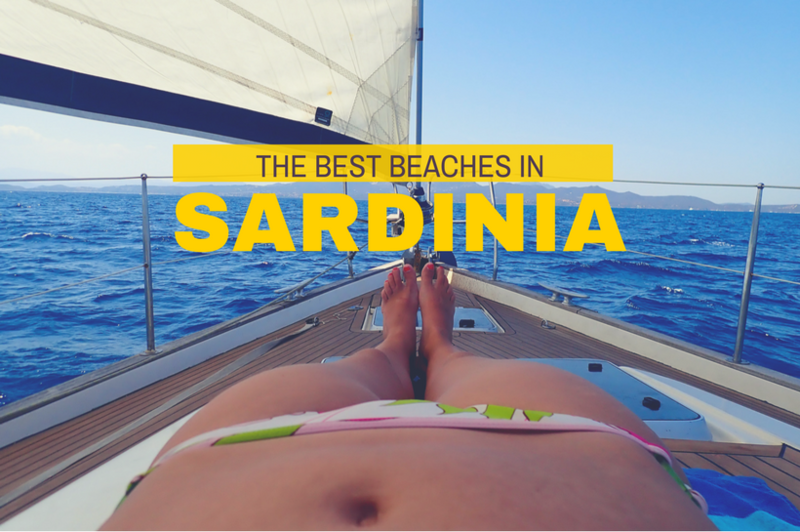 I hope this article will help you to make the best of your visit! Bandaranaike International, Sri Lanka’s main international airport is situated x kilometers from Colombo. 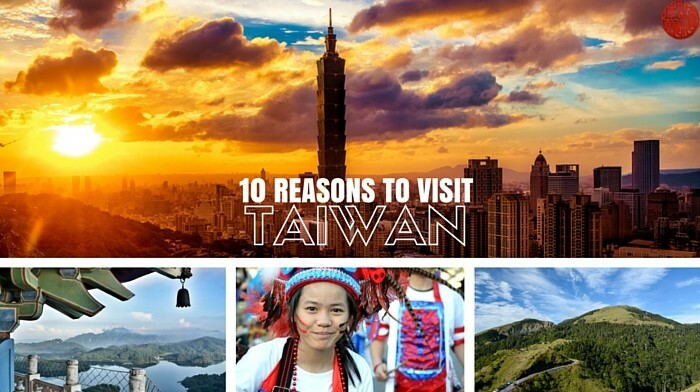 The trip takes one hour by taxi at the time of the traffic jam and 30 minutes otherwise. Taxi– it will cost you around 15-18 USD (in local currency, that is 2500 to 3000 LKR). The cars have AC. Some of the 4 and 5-star hotels have their own counter at the airport, where they sell you a taxi at this rate. All others should offer the same fixed price, but you have better to agree in advance on the amount and currency to avoid problems. Bus– Bus is the cheapest way to get to the city: it will cost you only 0,70 USD (120 LKR). It is a pretty smooth trip of around 30 minutes since the bus is following takes the expressway to Colombo The number of the bus is 187-E3, it is air-conditioned. The bus stop is just across the terminal. There are several ATMs at the airport: although no all of them might work for your type of a credit card, it is good to withdraw some first cash to get some water (always buy bottles!) and buy your transportation from the airport. Please be cautious of any people offering you any kind of help. Some of them are just tourist scams. If you let someone to carry your suitcase, be ready this is a service you will have to pay. One day is not really much so you have to be picky. I totally recommend you to visit at least one or two temples. Below I share places that I managed to visit in one afternoon. 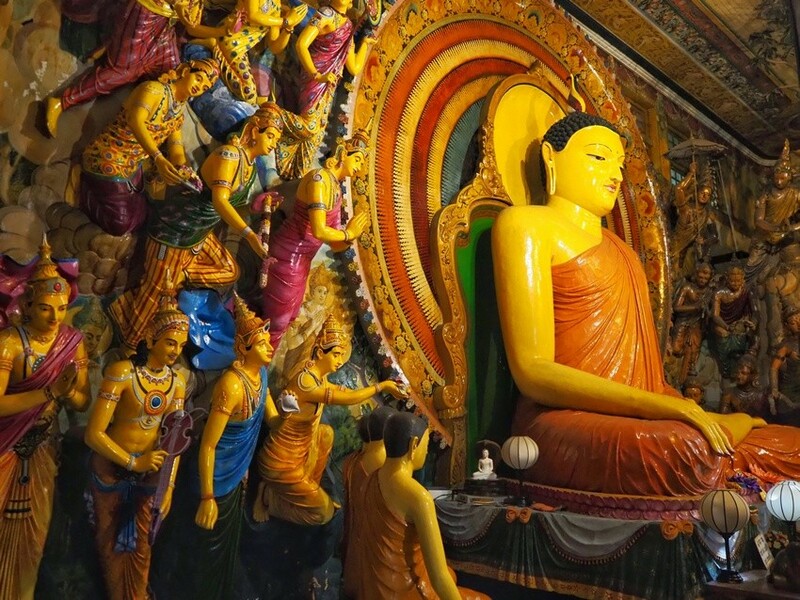 Among many temples Sri Lanka capital has to offer, the 120-year-old Gangaramaya is quite different and definitely a place to visit in Colombo in one day! 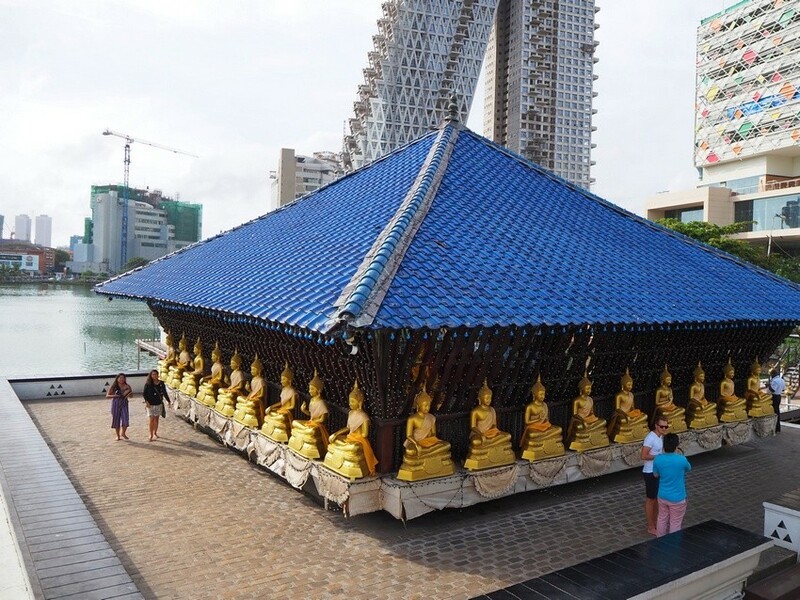 The temple is Buddhist, featuring an interesting mix of Sri Lankan, Thai, Indian, and Chinese architecture. The highlight of the temple is a massive Buddha statue in meditation pose located in the main sanctuary. 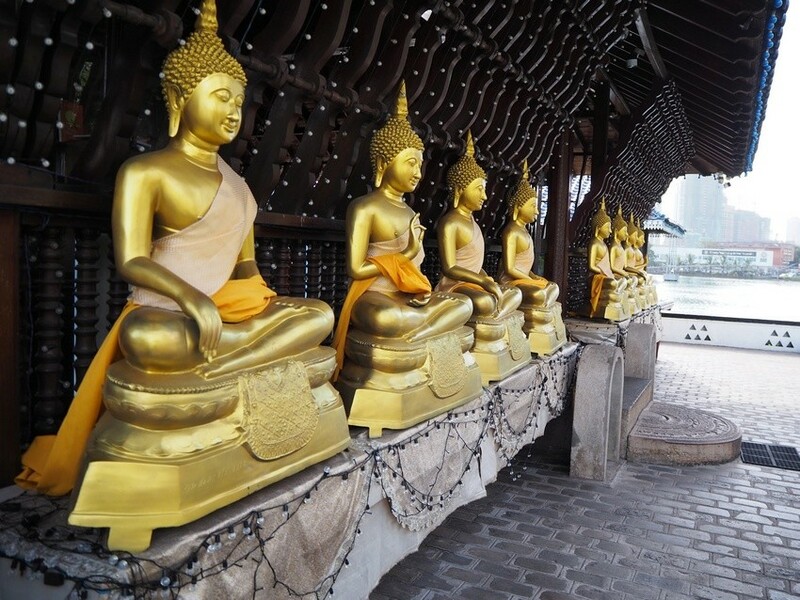 The entrance is special, too: don’t miss the golden Buddha statues at the entrance and wonderfully carved wooden door. Another interesting thing is a tiny Buddha statue that is said to be the smallest one in the world. There is a small entrance fee to pay Gangaramaya temple (LKR .200/ USD 1, 5). Once you are out spending your one day in Colombo, visiting its busy streets, you will be grateful to find such a small oasis as Beira Lake. 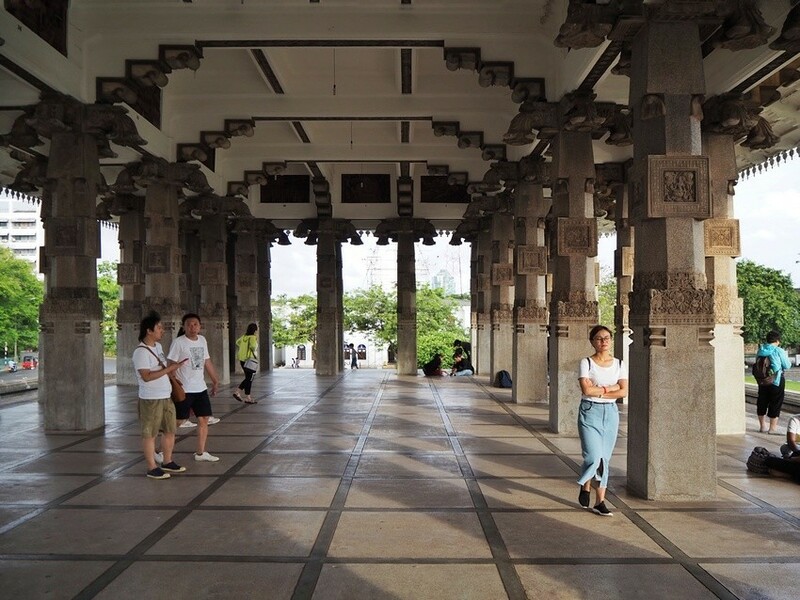 It’s a green area in the heart of the city, locals go her for relaxation and many couples borrow a small boat and enjoy private time together. There is a pedestrian footbridge over the lake leading to the small island with ducks and swans running around. Interestingly, place which today serves a relaxation was once mainly defense barrier: Portuguese build it to provide protection to Colombo from enemies mainly local kings. Situated directly at Lake Beira, this small temple is my favorite place in Colombo. 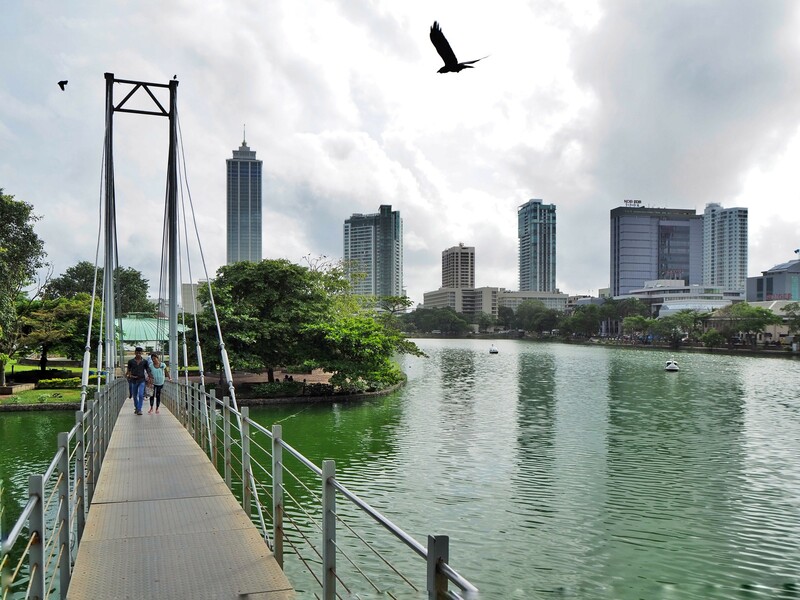 The location makes it very special: it’s situated in the bustling inner-city Colombo, overlooking the scenic Beira Lake. Seema Malaka is in facst considered to part of the largest Gangaramaya temple, but it is standing a short tuk-tuk ride away. 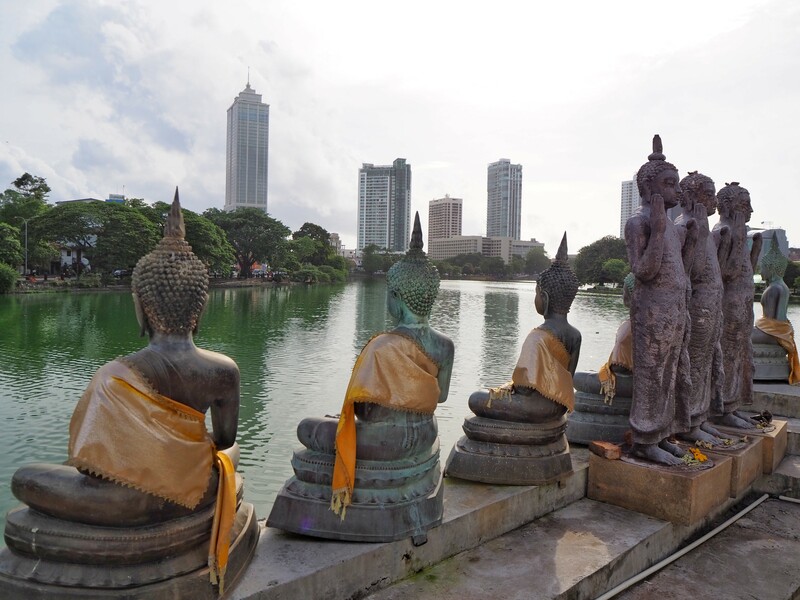 Much of the temple is situated on three platforms in the open space over the water, so you always see the lake as well as the modern skyline of Colombo. The temple construction is connected with each other by pontoon bridges. The temple as seen today is constructed by Sri Lanka architect Geoffrey Bawa at the place of the original temple, that had spanked to the water in 1970. This is an amazing place to visit at any part of the day: the cold stones and shadow make it a cool stop. There is always a fresh breeze inside. The Memorial hall is located in the Cinnamon Gardens, a quarter full of amazing threes and notable buildings including many embassies. Nearby you can make another green escape and enjoy a stroll around The Viharamahadevi Park (formerly Victoria Park), is the oldest and largest park in Colombo. You can find here a huge Buddha statue, a series of water fountains and cricket ground. 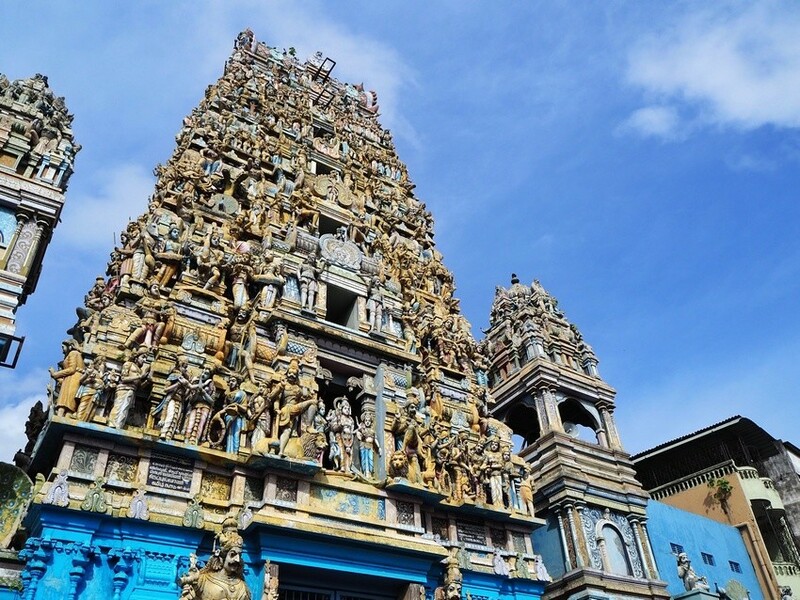 ONE DAY IN COLOMBO – ALONE OR ON A TOUR? Unfortunately, Colombo is not one of those easily walkable cities. The major sights are spread across the city and distances are rather big. If you want to visit the city on your own, I recommend using a tuk-tuk to move around. It ’s an experience in itself and quite fun. Just make sure you agree in advance on the price to avoid surprises. If you prefer to visit a city with a local guide, or you simply want to fit in as much a possible, I recommend taking this tour. You will explore city for 3,5 hours on a tuk tuk, without having have to argue the price. Alternatively, if you have more time, there is a full day Colombo tour, too. Check the availability for your dates here. 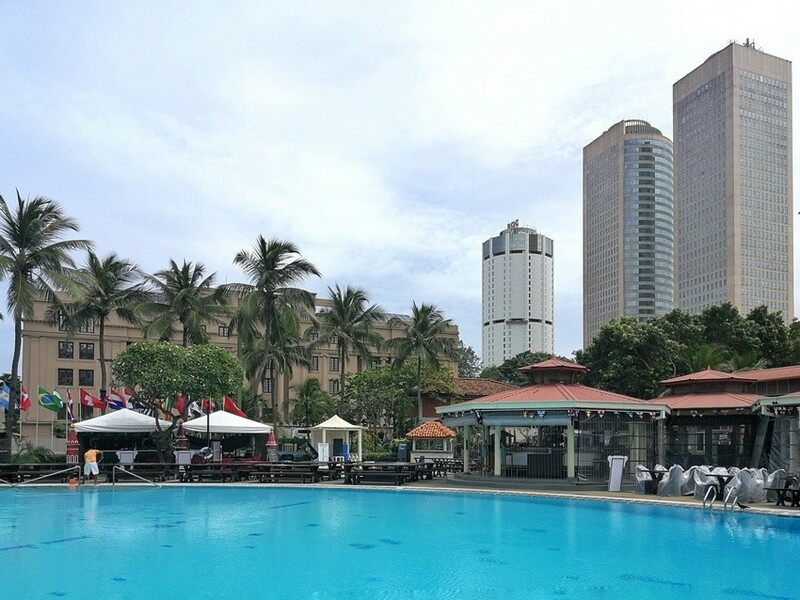 There are a lot of accommodations options in Colombo, however, I strongly recommend booking the hotel before your arrival, so that you know where you are heading when traveling from the airport. I have stayed in amazing Hotel Hilton, but I have included two more hotels in case that this one is out of your budget. Luxury: Hilton Colombo Hotel. With amazing lobby and a great restaurant, Hilton is definitely a place to splurge in Colombo. Their outdoor swimming pool is a great place to recover from jet lag. Five star hotel. Price: from 170 USD per night. Check the availability here. Mid-rage: Renuka City Hotel. Just 100 m from Liberty Plaza Shopping Complex, Renuka City Hotel has free parking. Airport is a 1-hour drive away. Swimming pool and outdoor terrace to enjoy. 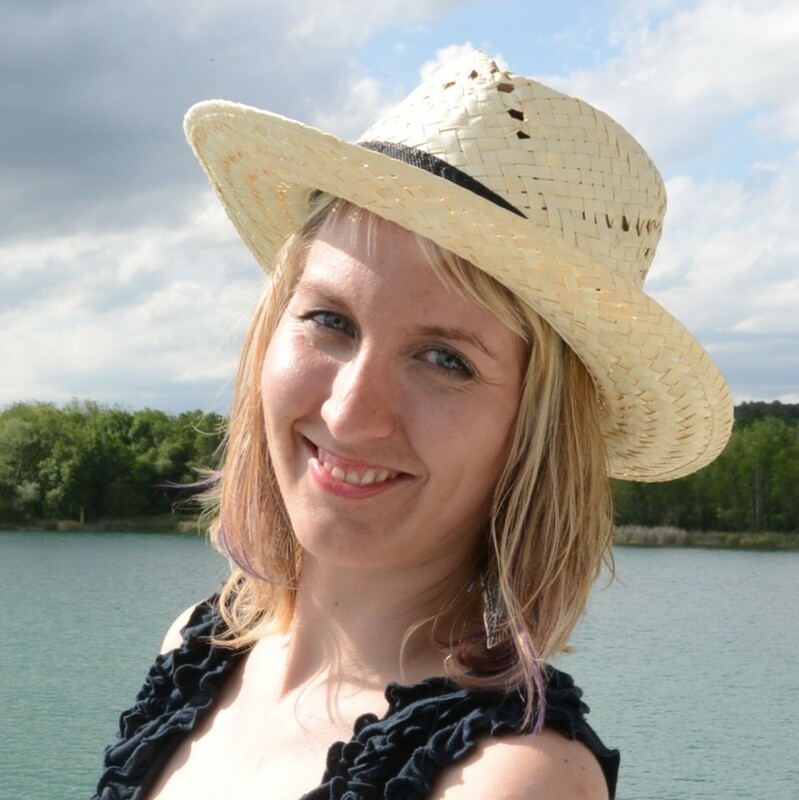 Price: from 100 USD per night. Check the availability here. Budget: A One Hotel – “The Marine”. This three-star hotel is located five minutes’ walk from the beach. Sounds like a great value and place where I would stay. Price: from 66 USD per night. Check the availability here. The trip was in partnership with Sri Lanka Tourism Development Authority. Pictures are taken with Olympus PEN E-PL9.